Roma, Italy’s biggest sports arena. traditional Roman colour burgundy with gold detailing around the stars. Mosaic figures representing key sporting and Roman values such as speed, teamwork, justice and power are featured in each star honoring the most important European club game. 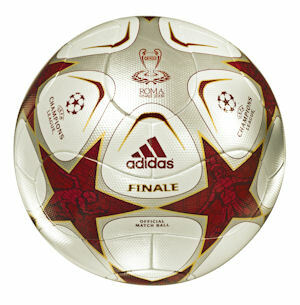 Like the “EUROPASS”, the match ball for the UEFA EURO 2008™, the adidas “Finale Rome” features the innovative surface structure, PSC-Texture™. This surface structure allows players to control and direct the ball perfectly in all weather conditions. The PSC- Texture™ consists of a sophisticated and extremely fine structure on the ball’s outer skin that guarantees optimum grip between ball and boot. Due to the usage of this material, the ball texture feels like goose bumps. In addition, like the “EUROPASS”, the adidas “Finale Rome” is constructed out of 14 panels using revolutionary Thermal Bonding Technology. The adidas “Finale Rome” is currently available at retail worldwide. adidas’ experience in football production is unsurpassed anywhere in the world. adidas has been making footballs since 1963 and is now the world’s leading manufacturer, always at the cutting edge of technology. adidas has supplied the official match balls to all major UEFA and FIFA tournaments since 1970, and since 2008 is also the Official Supplier of the match ball for the Africa Cup of Nations organized by the Confederation of African Football (CAF). adidas will continue to use innovative technology to extend its leading position in football worldwide. This will further strengthen adidas’ position as the authentic symbol of high-performance sports equipment for professionals and amateurs alike. 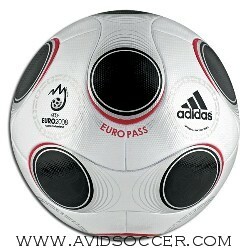 adidas also intends to unveil more revolutionary ball innovations for future UEFA, FIFA and CAF competitions. You know so many interesting infomation. You might be very wise. I like such people. Don’t stop writing.